With the smell of breakfast gently filling the air with pleasing aromas, the group of campers hastily finishes packing their tents and breaking camp to begin another day on the river. This group (officially called sojourners), numbering a little over 100, are on the first day of what will be a seven day adventure on the Juniata River. Each person is here for different reasons, but they all share a love for the outdoors and the beauty of the river. Some are veterans of many a trip but there are also a number who are experiencing this event for the first time. Once breakfast is done and vehicles packed; people begin assembling along the river’s edge that is lined with canoes and kayaks of many different colors. They are checking equipment, filling water bottles, and putting on their personal floatation device in anticipation of the day’s adventure. All are anxious to hit the water as they say. What you may be asking is this madness that overcomes normally sane people? It is the annual Juniata River Sojourn and it happens every year during the second week of June. 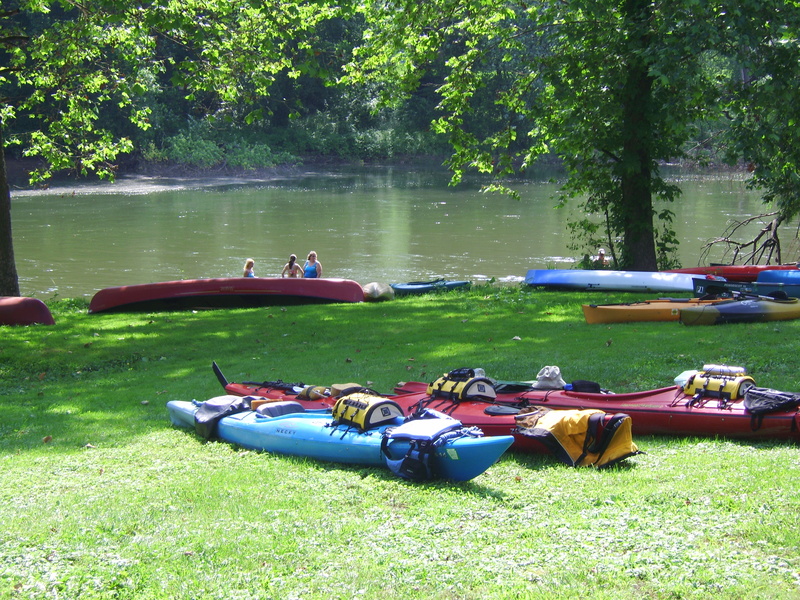 Mapleton’s Riverside Park will be the starting point of the 2013 Juniata River Sojourn on the Main Stem of the Juniata River. The Juniata River Sojourn is a multi-day floating trip down the river that combines beautiful scenery, a touch of history, and great friendship into a fulfilling vacation. event in which all participants float together, eat together, and camp together. It is a bonding experience with like-minded people. An added feature we provide is that the trip uses professional outfitters provided by Rothrock Outfitters who know the river well and can offer help with paddling and always stress safety first. You kind of leave the driving to us. All of your comforts are met. Well almost all; sometimes showers are at a premium and port-a-potties are the norm. But as far as outdoor adventure goes, I can promise that meals are good and hot and the campsites are usually cozy. But the best feature of all is the fact that the trip is family oriented and is the perfect place for parents, children and sometimes grandparents to enjoy the outdoors together. concluded at eight AM, drivers of all vehicles assemble in a convoy to shuttle gear and vehicles to the next campsite. A bus awaits them there to shuttle people back to the launch site. Once everyone is ready to go, a brief safety talk is conducted and we are on the water. Just the sight of so many boats in one place is inspiring. The dew hanging low on the water in the early morning gives peacefulness to the beginning trip. As boats slowly drift downstream the excitement of what lies ahead and the pure freedom that you feel is hard to duplicate anywhere else. Paddling along with people you only met yesterday or with old friends from many a sojourn past, you begin to form bonds that sometimes last a lifetime. Sharing the sight of a bald eagle soaring aloft or the splash of a river otter as it slips into the river makes you appreciate the natural beauty the river has to offer. But wildlife is not the only sight that awaits you. Paddling is a favorite pastime on the main stem of the Juniata River in Huntingdon County. offers it all. Float the Raystown Branch and you can see the remnants of the double covered bridge near the site where British soldiers forded the river and you feel yourself drift back in time. The afternoon float offers similar experiences as the morning but it also has something that is just a whole lot of fun; and that is water fights and rope swings. There are many places along the river for opportunities to swim, swing off of rope swings, or just play. 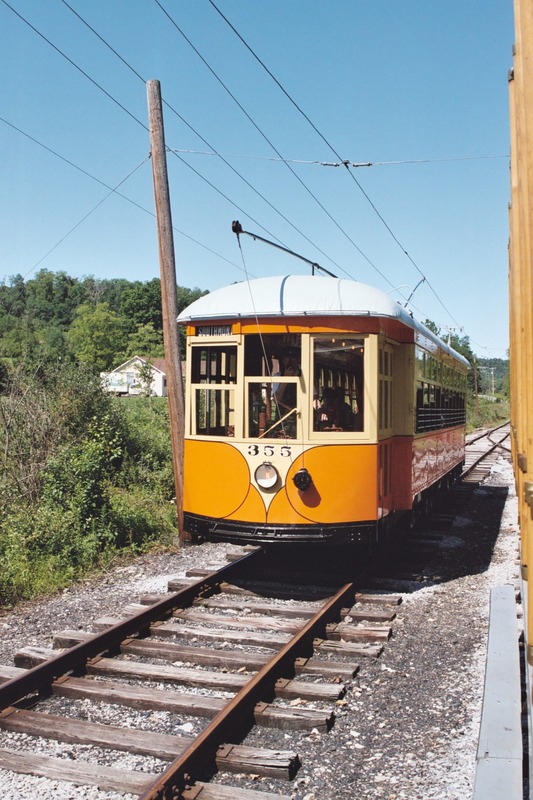 The Juniata Sojourn certainly provides many chances to do just that. The days on the river are very relaxing and the outfitters allow plenty of time for enjoying the wonderful experiences the river provides. So kickback and allow the stress of everyday life to drift away. Nighttime brings an air of silence and peace. 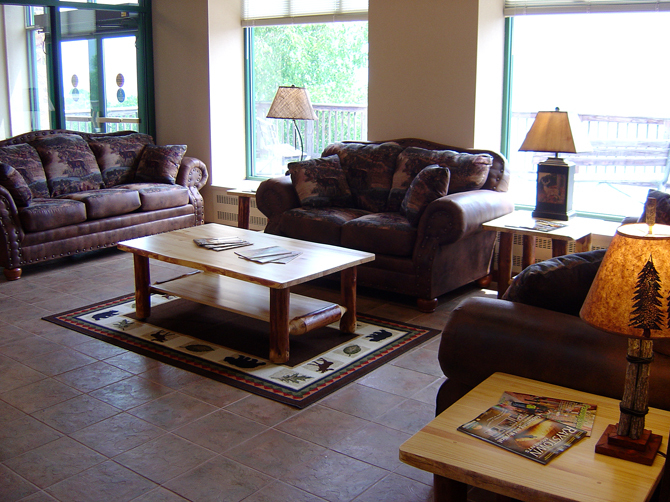 The full day of activities and great food leaves a person satisfied and sleepy. Those tents sure look inviting and the sleeping bags bring relief to tired muscles. Sleep comes quickly and as nature’s nighttime sounds fill the air, dreams of the what lies ahead tomorrow fill your head. Just another day on the Juniata River Sojourn. The 2013 Juniata Sojourn will be held June 8 thru 12, 2013 on the main stem of the Juniata River. Registration will open on April 8 and can be accessed at www.jcwp.org. You do not have to be an experienced canoeist or kayaker to join the fun. Just remember that everyone had to start sometime and what better place to learn than with experienced guides/teachers and a group of friendly helpful people. 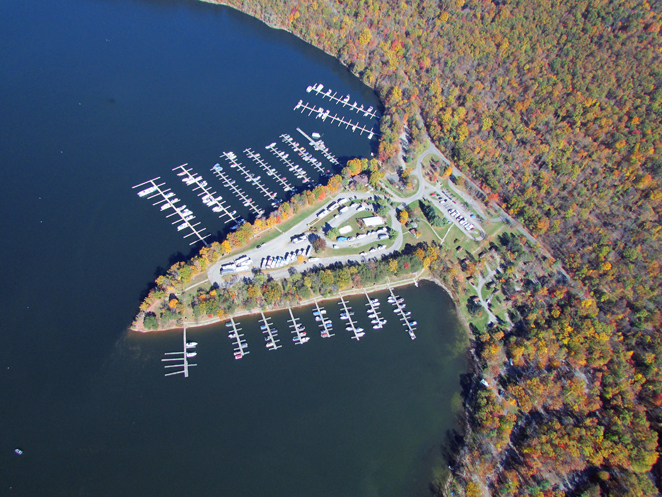 If you do not have a boat, Rothrock Outfitters (814-643-7226) will gladly offer rentals to fit your needs. Ask for Tony, Paul or Evan and they will put you in business. If you are looking for new adventures or taking up kayaking again, a sojourn is just the ticket for you. If your interest is peaked than call Mike at 814-506-1190 and I can answer any questions you may have. I look forward to seeing you on the river. 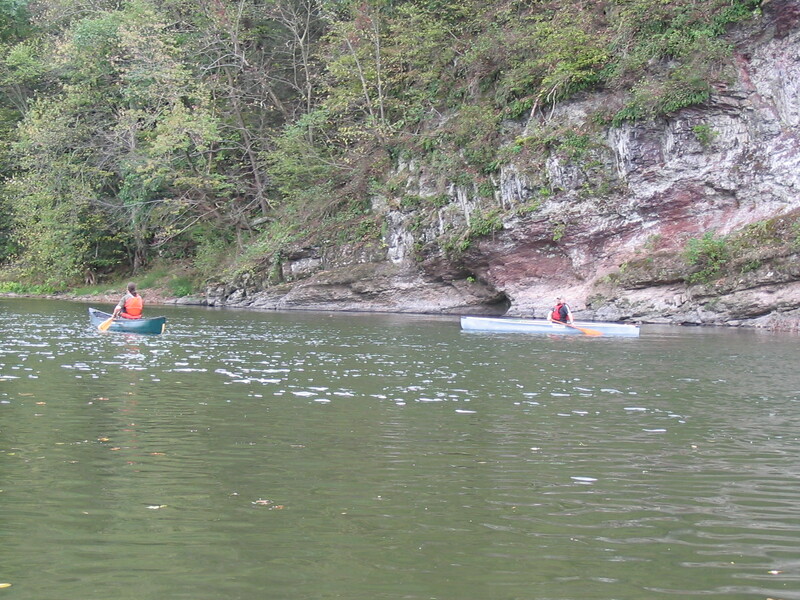 Vote Now for the Juniata River to be Pennsylvania’s 2013 River of the Year! The public again is invited to vote online for the 2013 Pennsylvania River of the Year, choosing from among six waterways nominated across the state. Mapleton’s Riverside Park will be the starting point of the 2013 Juniata River Sojourn on the Main Stem of the Juniata River, a candidate for River of the Year. They are: Juniata River and Swatara Creek in south central Pennsylvania; Kiskiminetas River and Monongahela River in the southwest; Lackawanna River in the northeast; and Schuylkill River in the southeast. Nomination of the six waterways was based on their conservation needs and successes; as well as well as celebration plans should the nominee be voted 2013 River of the Year. Visithttp://pawatersheds.org/vote to read the nomination statement for each and to vote. Voting ends Friday, Jan. 18, 2013. DCNR and the Pennsylvania Organization for Watersheds and Rivers, or POWR, administer the River of the Year program. Nominations were made by local groups. Pennsylvania’s River of the Year is an honor designed to elevate public awareness of specific rivers and recognize important conservation needs and achievements. River of the Year designations have been presented annually since 1983. After a waterway is chosen, local groups implement a year-round slate of activities and events to celebrate the river, including a special extended paddling trip known as a sojourn. These water-based journeys for canoeists, kayakers and others raise awareness of the environmental, recreational, tourism and heritage values of rivers. The Pennsylvania Sojourn program, jointly run by DCNR and POWR, is a unique series of a dozen such trips on the state’s rivers. For more information about the sojourns, visit http://www.pawatersheds.org. POWR and DCNR also work with the local organization to create a free commemorative poster celebrating the River of the Year. Pennsylvania’s 2012 River of the Year is the Stonycreek River, flowing through Cambria and Somerset counties. 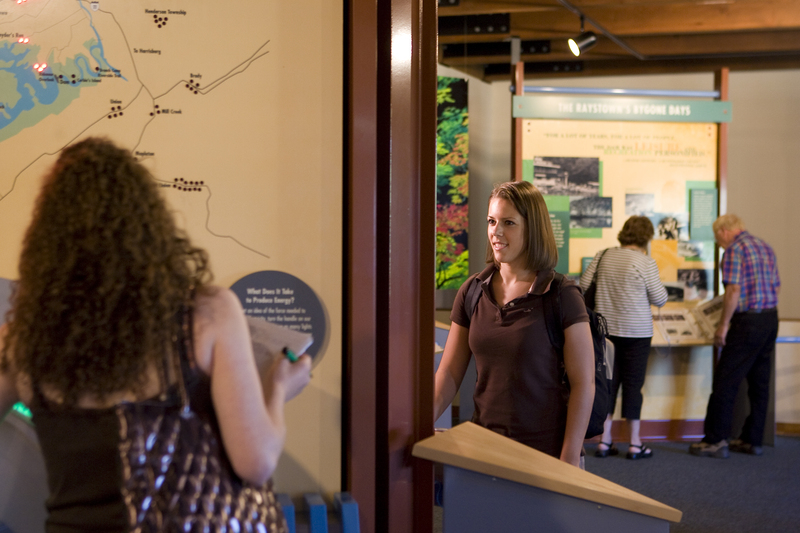 To learn more about DCNR’s Rivers Program, visit www.dcnr.state.pa.us (click on “Conserve,” then “Waterways”). Download this press release (Word document). Yesterday was the first of what will be a series of outings for the staff of the Huntingdon County Visitors Bureau called Monday Meanders. 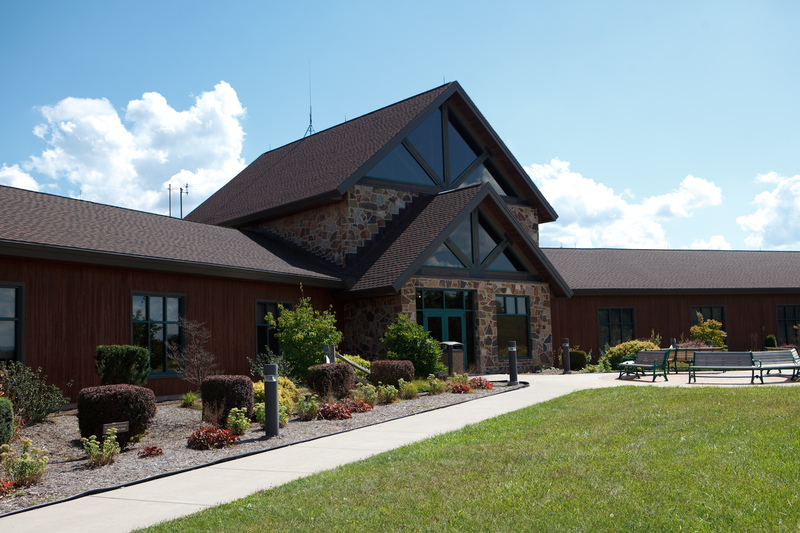 With the blessing of our board of directors (thank you) and the Army Corps of Engineers, from now through the middle of May, we will be closing the HCVB offices in the Raystown Lake Region Visitors Center at 3pm on Mondays. The purpose of this early closure is to give our staff the opportunity to get out and experience the area, its recreational assets, and our member businesses, in order to better serve all of our customers. 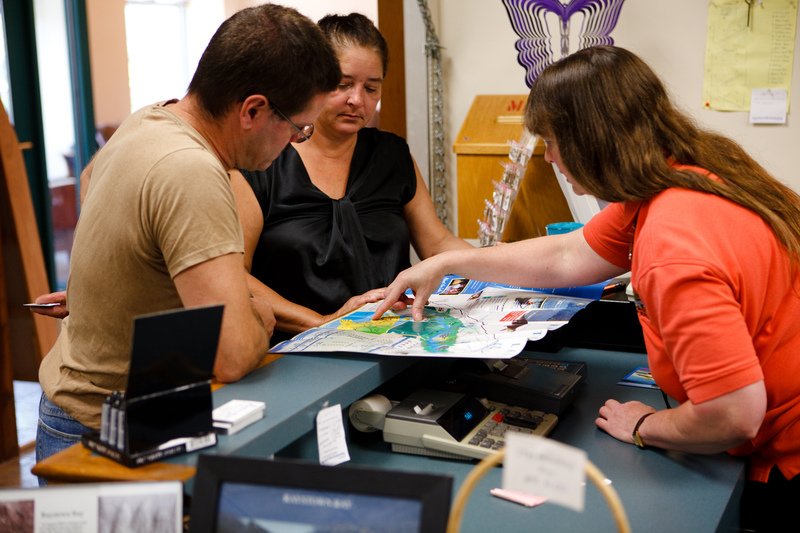 With a year-round staff of four employees, we are each taking a turn during the month to plan the outing. For our inaugural Meander, I took on the planning task. Our missi0n: to experience a new trail leading from the Visitors Center to the Allegrippis Trailsstacked-loop system on mountain bikes. 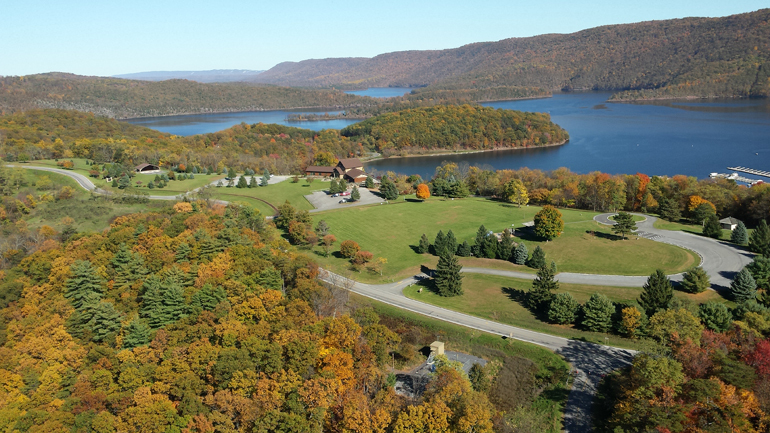 The VeeCee Trail connects the Raystown Lake Region Visitors Center in the Seven Points Recreation Area to the stacked-loop Allegrippis Trails. 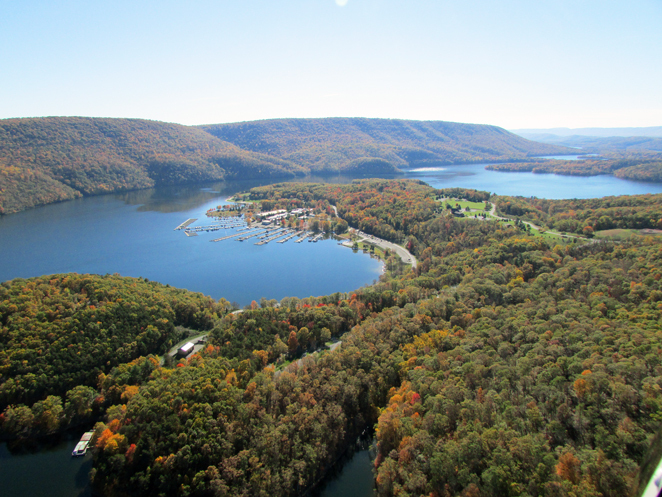 First, some background: The Allegrippis Trails at Raystown Lake opened with much fanfare in May, 2009. The 32-mile trail network was designed by mountain bikers and built through the cooperation of the US Army Corps of Engineers, Appalachian Regional Commission, PA Department of Conservation and Natural Resources and others. 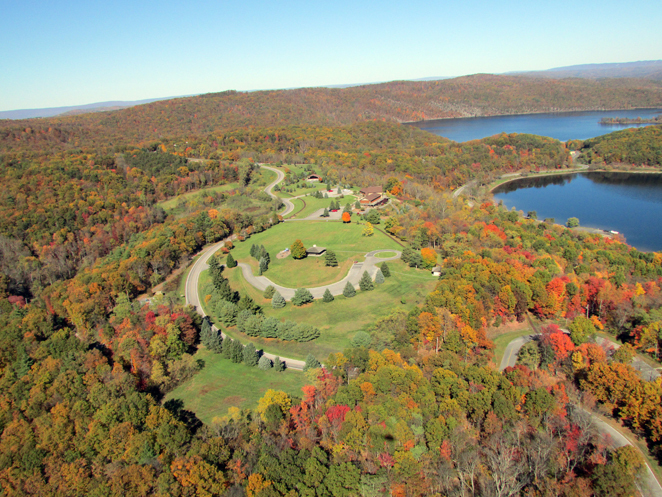 The right-of-way for the trails on the USACE Raystown Lake property is leased by the Friends of Raystown Lake, a 501(c)(3) organization whose mission is to enhance the environmental and recreational resources of the lands and waters of the Raystown Lake Project. The Friends contracted with the International Mountain Bicycling Association (IMBA) Trail Solutions crew to construct the trail network, and augmented the machine work with volunteers to put on the finishing touches. The result is a fast, flowing, fun network of trails that can accommodate riders or hikers of nearly any ability level. The trails were also constructed in a way that minimizes erosion. Originally, trailhead parking lots were available along Seven Points Road, and Bakers Hollow Road. Both trailheads were shared with the existing Old Loggers Trail. It became evident immediately that additional parking capacity was needed. The Corps approved a plan by the Friends to expand the lot along Bakers Hollow Road, and that helped, but still more parking was needed for a popular trail network that has exceeded all expectations of its ability to attract users. 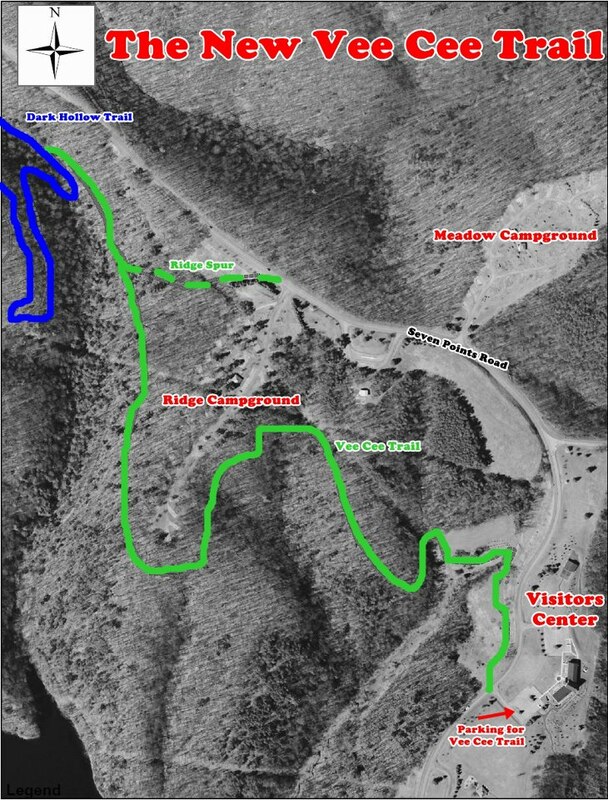 The Friends proposed a few other options for expanding parking, but none of them met with the approval of the Corps until the idea emerged to connect the trails to existing parking at the Visitors Center. This idea proved to be a win-win by connecting the developed part of the Seven Points Recreation Area with the trail network, and requiring minimal clearing of plant and animal habitat when compared to creating a new parking lot. Fast-forward to May 2012. The 1.3-mile VeeCee Trail opened with the financial support of the Friends, Huntingdon County Visitors Bureau, and Specialized. The trail connects the lower parking lot at the Visitors Center with Dark Hollow Trail by following a path around the end of Seven Points Campground’s Ridge camping loop. Now, back to yesterday’s Meander… Evan Gross from Rothrock Outfitters met us in the parking lot about 3pm with four Scott mountain bikes. He took the time to adjust the bikes for us, pump the tires, and give us instructions for shifting gears and a few other helpful tips like making sure to put your outside pedal in the down position when negotiating a bend in the trail. Why? Because if the inside pedal is down as you lean into a turn, it is likely to catch the ground and cause an accident. For some of us it was the first time on a bike since we were teenagers (we’re all in our thirties, forties or fifties). We did a few laps around the parking lot to get comfortable with the bikes, shifting, braking, etc., before we crossed Seven Points Road to the trail. We discussed a few tips we had learned from trail reviews, one of them being not to over-brake on the downhills, because you’ll want that momentum on the uphills. Another tip being almost counter to the first one. These trails will propel you faster than it may seem, and faster than you may be comfortable with – don’t let it get out of hand. The result of these pieces of advice turned out to be that we over-braked on the way out, and wound up pushing the bikes up a few of the hills. And at least twice on the return trip, I let momentum carry me out of my comfort zone resulting in some near-misses with trees. In the end, we got to experience an asset that we talk to a lot of visitors about, nobody got hurt, and we all had fun. Mission Complete! Next week it’s Vickie’s turn to plan something for her and Katrina to do. Ed and I both have the day off to head to a Pittsburgh Pirates game with our families.